The controversial Jakhu Aerial Ropeway Project has run into trouble again with the Union Ministry of Forests taking cognisance of a complaint that the project proponent M/s Jagson International Limited had misrepresented facts while seeking exemption from environment clearance. The chill and thrill of ski slopes of the Solang valley and brilliant sunshine in the hills of Himachal Pradesh beckon New Year revellers and those who want to escape the bone-chilling foggy plains in the North. The creation of new districts in the state seems to be a tough task for the ruling BJP government as it is not only facing opposition from Congress leaders GS Bali and Chander Kumar, but within the BJP also a number of senior leaders are against the reorganisation of districts. Expressing concern over the issue of lack of medical facilities in the Rohru Government Hospital, the state high court has directed the state government to fill all 10 posts of Medical Officer lying vacant in the Civil Hospital, Rohru (Shimla). There appears to be no end in sight to the water woes of Solan and its surrounding areas which are being served by the Rs 64-crore Giri Lift Water Scheme as the transmission wing of the HP State Electricity Board is yet to award tenders for setting up a substation for the scheme. Prashant Bushan, member, Team Anna, said a decisive phase of the anti-corruption movement had started for seeking the establishment of that democracy in the country in which people would directly decide the kind policies, laws and important decisions that needed to be taken. The state CPM, which yesterday elected its 25-member state committee, announced to hold a statewide agitation against privatisation, closure of ration shops and the “failure” of the state government to keep a check on rising cement prices on January 9. The State Bank of India (SBI) organised a function at the Tutikandi Bal Ashram to celebrate Christmas here today. Chief General Manager NK Chari, who was the chief guest, presented the inmates with a 42" LED television set and heat pillars. Addressing the gathering he said the facility of television would not only provide a source of entertainment to the children, but also enable theme to gain knowledge about the latest developments. The sales turnover of the State Civil Supplies Corporation has increased by 8 per cent in the first eight months of the current financial year. A mock drill on emergency preparedness and quick response was organised at the state secretariat premises here today to sensitise employees and train them in protective measures in disaster situations like fire, unforeseen incidents and other mishaps. Scientists of the Dr YS Parmar University of Horticulture and Forestry, Nauni, have achieved a rare feat by developing high- yielding hybrids of white button mushroom through crossing. A team of the Forest Department officials, led by Range Officer Garja Ram, caught a leopard which had attacked a hen cage of Prem Singh of Sandyaar village under Chhatt gram panchayat in Ghumarwin here today. The leopard entered the cage in the wee hours. They immediately closed the door of the cage. Only 24 cases of grievances, difficulties and problems of villagers could be solved out of a total of 165 cases presented at the district-level day-long Prashashan Janta ke Dwar camp held at Kandraur near here yesterday. In the wake of state government’s directives to demolish illegal constructions and encroachments on the government land, the warrants of ejection have been executed in 156 such cases at various locations in Chamba district. Of these, Chamba tehsil has the highest number of 63 cases and the Dalhousie tehsil has 38 cases, besides other parts of the district. Chief Minister Prem Kumar Dhumal has expressed grief over the death of Mahavir Chakra awardee of the 1971 Indo-Pak war, Brig AN Sharma, who was killed in an accident near Chandigarh two days ago. The Indian National Army (INA) freedom fighter sepoy Jagat Bahadur Gurung (90), a resident of Chanmari village near Dharamsala, died at Siddhbari yesterday and his last rites were performed with state honours at his native village Sidhpur today. After examining the point raised in the complaint, the ministry has concluded that the project proponents had misled it by providing a non-valid forest clearance of 1992 in spite of the fact that they had submitted the case for a fresh forest clearance. The company furnished wrong information and concealed facts to mislead the ministry. It further observed that as per the documents provided by the Chandigarh regional office, the project would need environment clearance as the ropeway projects were covered under the Environment Impact Assessment Notification, 2006. The director of the division had on October 24 informed the Director (Vigilance) of the ministry about these facts and said action be initiated under Section 5 of the Environment Protection Act and for the violation of the EIA Notification, 2006, and the company be asked to obtain environment clearance as required under the notification. 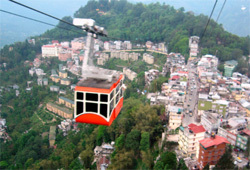 As per sub-rule (3) of rule 5 under the Environment Protection Act, environmental clearance is mandatory for all ropeway projects that figure in category “B” of the schedule. The State Environment Impact Assessment Authority is competent to grant clearance for the projects placed in category “B” in general. However, if the project is in the vicinity of a protected wildlife area, the case goes to the central authority. Under the laid down process, an environment impact assessment (EIA) report is prepared to bring out potential environmental impacts. On its basis, a public hearing is conducted to address the concerns of the local people while framing the environment management plan (EMP). A public hearing is conducted under the chairmanship of the Deputy Commissioner concerned or his nominee but not less than the rank of Additional District Magistrate. Necessary restrictions are imposed in the EMP to ensure that the project is implemented without damaging the environment or harming the interests of the local people. In this case, no such exercise was carried out. Far from the “shivering and foggy days of plains in the North”, the hills of Himachal are blessed with warm days and tolerable chill at night. The temperature has been normal in the hills and it makes winter holidays enjoyable for tourists as Manali experienced snow earlier this month, say travel agents. Hoteliers hope for a 100 per cent occupancy for the New Year bash in Manali even as hotels could not exceed 50 per cent occupancy on the eve of Christmas. The same holds true for Shimla. The potential visitors on Christmas were forced to remain indoors, thanks to the shivering chill in the plains, the travel agents said. What is worrying hoteliers this time is that Kingfisher Airlines has cut down its daily flights from Delhi to Bhuntar to thrice a week since early December. Even Air India has been operating its flights only thrice a week. Moreover, Gulmarg in Jammu and Kashmir has attracted a good chunk of tourists this time, said travel agents. The ban on travelling to Rohtang for outside vehicles and the pathetic condition of the Mall also hit the inflow of tourists to Kullu and Manali, the hoteliers said. The ski slopes of the Solang valley are always thronged by tourists as local operators offer ropeway rides across the snowy mountains, skiing for snow sports lovers and paragliding. The hotels, including the government-run HPTDC, are offering holiday packages for the New Year revellers. 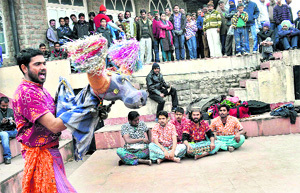 HPTDC’s General Manager Yogesh Behl said the occupancy in their hotels was more than 70 per cent in most hill stations, including Shimla, Manali and Dalhousie, and it was expected to increase for the New Year Eve. “We are offering packages, including ‘pahari natis’ and Himachali cuisine at reasonable prices to the visitors in Manali and Shimla,” he added. President of the Manali Hoteliers Association Gajender Thakur said: “Big hotels normally attract a good number of visitors on Christmas eve, but the tourist inflow this time did not surge to last year’s level. I hope the occupancy will improve for the New Year’s bash with December 30 and 31 being a week-end,” he added. In fact keeping in view the large-scale urbanisation and increase in population, the creation of new districts has become essential for the government. This exercise has been pending since 1984 when the then Chief Minister Virbhadra Singh had initiated a move to create two more districts at Palampur and Rampur Bushar. Later, because of opposition from senior party leader Sat Mahajan, he too failed to implement his plan. In 1998, when the BJP was voted to power, Chief Minister Prem Kumar Dhumal had announced to create six more districts at Palampur, Rampur, Dehara Gopipur, Karsog and Sarkaghat. He also posted Additional Deputy Commissioners. Later in the assembly elections, the BJP was voted out of power and the new Congress government did not implement the orders of the previous government. Earlier in 1998, senior BJP leader Shanta Kumar had openly opposed the move for the creation of new districts in the state, but this time he has remained silent. The BJP government is again keen to reorganise the districts in the state. IPH Minister Ravinder Thakur and Nurpur MLA Rakesh Pathania are heading the move. However, till date the Chief Minister is non-committal and has publicly denied any such plans. BJP sources told The Tribune that all MLAs from Kangra were for new districts and had urged the Chief Minister to announce new districts immediately after the completion of the census operation in the state. It was also learnt that the MLAs were of the view that if new districts were created, it would help the party in the assembly elections in the state due in 2012. The court further directed it to fill up the posts of specialists in medicine, orthopaedics, gynaecology, ENT, paediatrics and radiology and also appoint regular anaesthetists and radiologists in the hospital on a regular basis. The court passed this order on suo motu proceedings initiated by it in this regard. While passing this order, a Division Bench comprising Chief Justice Kurian Joseph and Justice Rajiv Sharma observed that residents of the area had a fundamental right to get best health services. It was a duty cast upon the state to provide infrastructure and competent doctors to treat patients. The court further directed that till the doctors/staff were not appointed, the Chief Medical Officer, Shimla, and the Block Medical Officer, Rohru, will treat the patients by visiting the Civil Hospital, Rohru, every fortnightly. The court further directed the Secretary Health to file compliance affidavit before the Registrar General of the court within six weeks. Though tenders were awarded earlier to lay this substation, the contractor declined to initiate any work even after one and a half year. It is learnt that the bridge constructed for the scheme was declared unfit to carry load of heavy transformers forcing the board to scale down its capacity from the earlier proposed 132/33 KV 25 MVA substation to 132/11 KV 16 MVA as the bridge could not bear load in excess of 10 tonnes. The board has now re-tendered the work which, however, had been inordinately delayed. SE (design sub-station) Rajiv Bhardwaj said they were trying to expedite the process now and had completed the process of evaluating the techno-commercial bid and identified responsive firms. He added that once awarded the substation would be set up within a year. Since it would take another month for the completion of tender formalities and 9 to 12 months for laying of the substation at Gaura, it would be a year before the scheme could run smoothly. The Irrigation and Public Health (IPH) Department which had paid Rs 14 crore as the estimated cost of this substation in 2008 itself was suffering for no fault of theirs. Executive Engineer IPH JS Chauhan said the fluctuating voltage was damaging the sensitive machinery and they were forced to bear an expenditure of Rs 45 lakh recently when three motors had developed a snag. Since there was a virtual tug of war between the BJP and the Congress to claim credit for the scheme, its inauguration before setting up of a substation was now proving dear. The electricity board was not only charging the due water bill from the IPH Department but it had given no concession despite earning lakhs on the Rs 14 crore deposited with them since 2008. Sources said with the cost of construction having increased since 2008, the cost of setting up of this substation, too, appears to have escalated now. Bushan was talking to The Tribune at his residence at Kandwari village recently. He said following the current situation, a much serious question had arisen whether or not to continue with this kind of democratic system when people got elected once in five years, often by the use of money power, and ruled the country without consulting people. He said therefore a new phase of the movement would fight decisively for the establishment of a new kind of democracy. He said every referendum, opinion poll and survey indicated that 80 per cent people wanted the Jan Lok Pal Bill. Bushan said the Bill which was tabled in Parliament should more appropriately be called “promotion of corruption Bill”. The Bill had no investigating powers and the jurisdiction of the Lok Pal was not over 95 per cent of the government servants, Prime Minister, MPs and judges. An authority created and controlled by the government was likely to be used to harass those who were challenging corrupt actions of the government. The party elected Rakesh Singha as the new state secretary and a secretariat, comprising Onkar Shad, Tikender Singh, Kashmir Singh, Kuldeep Tanwar, Kushal Bhardwaj and Prem Gautam as its members. Announcing its decision after a state-level conference, the CPM stated that the party also elected Onkar Shad, Kashmir Thakur, Kushal Bhardwaj and Vijender Mehra as the delegates for the 20th party Congress to be held in Khozikhode in April 2012. A three-member control commission was elected with Ghanshayam Chauhan as its chairperson and Paras Ram and Lakhan Pal Sharma as members. A Vijay Raghwan, who is also the in-charge of the Himachal party unit, charged that the Congress government “works under the dictates of Indo-US friendship group that demands rampant privatisation of our public, services and the retail sectors”. He said the communist regime had initiated land reforms, policies of ration, education and other social sectors. Singha called upon the people to look for a third alternative force in the state. More than 31 delegates took part in the discussion and six resolutions were passed on SC/ST special component plan, implementation of the Forest Tribal Act and the 85th constitutional amendment, rising cement prices and relief, rehabilitation and resettlement issues in the state. Assistant General Manager OC Rana said the bank had been conducting free medical camps, awareness programmes, blood donation camps and other such activities on a regular basis. The SBI Ladies Club distributed sweets among the children. The children of the ashram presented a cultural programme on the occasion. 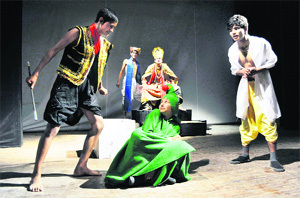 The Nati performance was the most acclaimed and compelled everyone to join. Superintendent, Bal Ashram, Leela Thakur thanked the bank for the gesture. Deputy General Manager AK Sahoo presided over the function. Stating this while presiding over a meeting of the Board of Directors of the corporation, Food and Civil Supplies Minister Ramesh Dhawala said the corporation had recorded a turnover Rs 645.58 crore till November. He issued directions to the officers to take all possible steps to ensure availability of essential commodities in the fair price shops so that the people did not face any inconvenience. He also asked the officers to speed up the process of computerisation of sale counters of the corporation and switch over to the e-tendering process at the earliest. It was informed at the meeting that the facility of fair price shop had not been withdrawn from any area. The corporation had closed down its 17 loss-making fair price shops only after making alternative arrangements. These shops were either being run by the local cooperative societies or private parties and people were being provided subsidised ration. The directors gave their suggestions to improve the functioning of the corporation. They suggested opening of departmental stores and super bazars in all the district centres. Prem Kumar, Principal Secretary, Food and Civil Supplies, Jagdish Sharma, Secretary to CM, Manish Garg, Registrar, Cooperative Societies, Amar Singh Rathore, Director, Food and Civil Supplies, and Padam Singh, Managing Director of the corporation, were present. Jawans of the Home Guards, Civil Defence and Fire Services also gave a demonstration on how to deal with the fire incidents. Secretary, General Administration, Ajay Bhandari said the objective of the demonstration was to create awareness among the employees and general public so that they were able to cope up with such emergencies. He said it was essential for the people to have knowledge of the do’s and don'ts during such disasters, and mock drills provided practical experience in management of such situations. He said there was a need to strengthen the communication system which was vital for providing prompt assistance to disaster victims. Chief Secretary Rajwant Sandhu also supervised the exercise. Officers of the Army Training Command (ARTRAC) and the district administration also reached the site. Additional Secretary, Secretariat Administration, Gopal Sharma said such mock drill would be organised from time to time. A meeting of the disaster committee and teams formed for the purpose would be held tomorrow to have a feedback on the mock drill and chalk out the future plans accordingly. The newly developed hybrid-4 is a cross between U3 and A-15 and it has recorded an outstanding average yield of 26.10 kg per 100 kg compost against 22.50 kg recorded in U3 and 14.02 kg in A-15 parents during the cropping period of 60 days on short method of compost. A significant breakthrough has been achieved in strain development programme of Agaricus bisporus (white button mushroom) by developing four hybrids through crossing, namely hybrid-7, hybrid-4, hybrid-2 and hybrid-1. Hybrid-4 is a cross between U3 and A-15. Hybrid-4 has not only recorded 18-22 per cent higher yield over parents but also exceeded in yield as compared to the other high-yielding strains of agaricus bisporus, including U3, vis-à-vis yield performance. Other important morphological characteristics of hybrid-4 which have made this hybrid significant includes its firm and compact fruit body, round shape, white colour, better shelf life and its ability not to open as fast as has been observed in the parent strains. Manju Sharma, a Ph D student of the Department of Mycology and Plant Pathology, UHF, Nauni, has been credited or carrying out this successful hybridisation under the guidance of Dr BC Suman. Dr KR Dhiman, Vice-Chancellor of the university, while complimenting scientist Manju Sharma and her guide Dr BC Suman, said it would prove to be a boon for the economy of the mushroom growers in Himachal Pradesh. Dr RC Sharma, Dean, COH, also visited the trial and congratulated the scientists for their achievements. Presiding over the largely attended camp, Additional District Magistrate (ADM) Darshan Kalia said people should take full advantage of these camps as all district officers were present there to settle their issues on the spot. He said the remaining complicated 141 cases were handed over to the district officers concerned with strict instructions to settle these at the earliest. The ADM also sanctioned Rs 5,100 for the marriage of a girl of a very poor family of Luhnu Kanaittan village of the area. District officers, including SDM Sandip Kadam and CMO Sudershan Sharma were present. The minutes of the meeting of the “efficiency in administration” held last month revealed that 65 religious encroachments were yet to be removed from the government land. The Churah tehsil of the district had the highest number of 25 such encroachments. There were 153 cases of religious encroachments made in the district but 88 had already been removed. Figures reveal that 73 encroachments had been detected in the forest areas. Out of these, 34 were found in Churah tehsil. In addition to these, nine cases had been detected on the fringe of the wildlife sanctuaries and reserve forest areas in the district. Out of the 178 cases of illegal encroachments discovered under the Roadside Control Act, barely 23 encroachments had so far been removed by the Public Works Department. However, 155 cases were still pending. Chamba Deputy Commissioner Sharabh Negi has asked the officials concerned to ensure that the illegal constructions and encroachments are removed and a report in this regard submitted. The DC asked the officials to adhere to the implementation of the provisions of the Town and Country Planning Act in Chowari township, the subdivisional headquarters of Bhattiyat, where unwarranted constructions were fast coming up nowadays. In his condolence message to the bereaved family, the Chief Minister said Brigadier Sharma had rendered outstanding services to the nation while he was in the Punjab Regiment of the Indian Army. He was also honoured with the Mention Dispatch for the exemplary courage shown during the 1965 Indo-Pak war and again in the 1971 Indo-Pak war, when he captured the ‘Nangi Tekari’ post in Western Sector. He said Himachal Pradesh had been a nursery providing brave and outstanding soldiers to the country and Brigadier Sharma was one of them. On the behalf of the administration, Tehsildar Shiv Dev and SHO, Dharamsala, Ramesh Rana laid the wreaths on his pyre. Chief Minister PK Dhumal condoled the death of the former INA soldier.